In the philosophical approach of Emmanuel Levinas, the focus on the relational and the experiential in relationship to the Other is fully developed with the general conclusion that ‘ethics is first philosophy’ which I translate as “we must ‘co-exist’ before we can ‘exist'” and that ‘ethics precedes ontology’–Being for the Other precedes Being for oneself. We are defined in terms of our relationships. 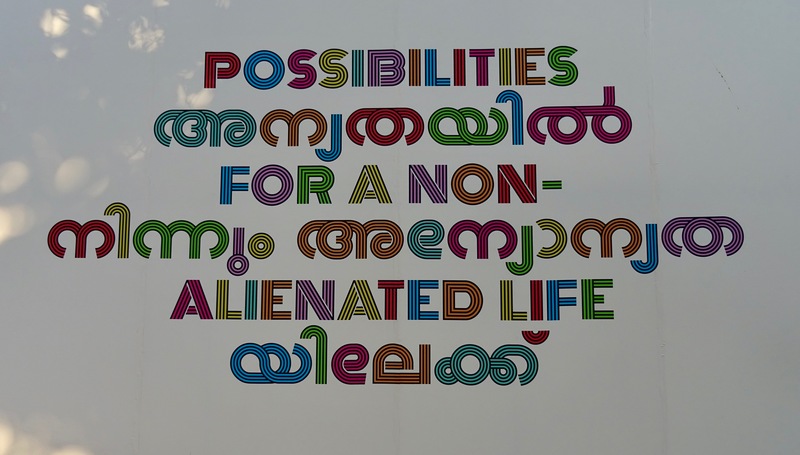 And yet we have a deeply ingrained self-protective tendency to ‘totalize’ and ‘reduce’ the Other that is encouraged through Cartesian egocentrism that, as a false absolutism, stands against relationalism or relativity–it is part of the overbalancing in the Western world toward the left hemispheric digitization of time and space that supports the drive toward totalization and self-isolation, undermining and de-legitimizing communication, eventually leading to binary thinking, dichotomization, and the perpetration of violence. Thought does not bring us into existence. We exist so that we can think about what existence means. There is a need to recover balance and integration, and the recognition of the invisible–the relational. Peirce called it ‘Thirdness’ or the mediational that maintains balance and complementarity. In Peircean evolutionary process metaphysics, this is the level of ‘Agapism’ or ‘Evolutionary Love’. Not self-serving Eroticism. But the recognition that we are commanded by the Other. We are responsible for the welfare of the Other. We are bound to the Substitution of ourselves for the Other. We define ourselves and who we are in terms of our relation to the Other. And we cannot expect reciprocation. We cannot expect benefit from beneficence. Thank you so much for this very helpful comment Gary. I need to look further into the work of Emmanuel Levinas and I still need to learn more about Peirce’s work. I have noticed that in recent interviews McGilchrist stresses the importance of the American pragmatists, James, Dewey and Peirce. As a teacher I am familiar with the work of Dewey, but need to become more familiar with the work of James and Peirce. I am expecting Peirce to feature more strongly in McGilchrist’s new book, which he has said is nearly finished. Thank you again for continuing the conversation about what I think is extremely relevant and important. In terms of my efforts to be ”part of the change” I have done a number of things … which all come clearly under the heading of “creating possibility for myself and others” … Currently I am working on a scifi movie script which is the vehicle for the message that Iain McGilchrist is trying to deliver to others. I would like your thoughts on one idea that I put forward in my script. I’m presenting cognitive dissonance as a key problem in the world (the story is set in 2029). A huge Neurotech corporation believes that by eradicating cognitive dissonance through brain rewiring, people will be happier, logical and law abiding etc. The protagonist believes that cognitive dissonance is required for the creative process as it arouses one into trying to put two opposing things together (find the “betweeness”). From my reading of Iain McGilchrist’s book I have extrapolated the ideas presented to the point where I have the protagonist state that it is the right hemisphere that is able to cope with and manage cognitive dissonance and not the left … and therein lies our society’s problem, assuming that it is the left hemisphere’s view that currently dominates … what do you think? PS If you are interested in reading my script I would be more than happy to send it to you once I have finished. It’s lovely to hear from you. Happy New Year. The script for your scifi movie sounds fascinating. 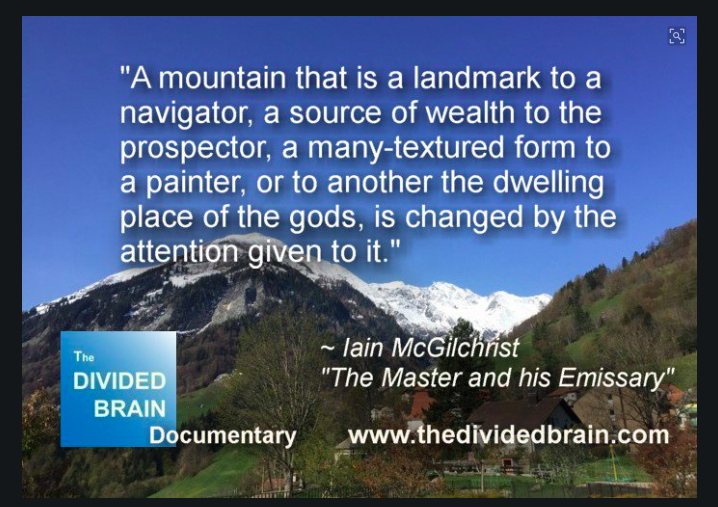 I wonder if you have written to Iain McGilchrist about it, or considered attending the course he will be speaking at here in the UK in June – https://www.field-field.com/courses/iain-mcgilchrist-exploring-the-divided-brain/ It would be interesting to hear Iain’s comments on this. Looking through his book “The Master and his Emissary’, I can’t find reference to cognitive dissonance. Instead, as you will know, he focusses on the different attention each hemisphere pays to the world. On p.130 he does reference an author, Michael Gazzaniga, who writes about ‘cognitive strategy’, who appears to believe that the left hemisphere has better cognitive strategies than the right, which McGilchrist dismisses. I’m not sure how this might relate to your script. One final thing that might be worth holding in the back of your mind is that every time I have heard Iain speak he always stresses that both hemispheres are involved in everything, it’s just that they do things differently and attend to the world differently. There is probably a good reference to this somewhere near the beginning of the book, but I would have to look for it. I would be very interested to read your script. You seem to be working with some very complex ideas. Ultimately, the best person to read it would be Iain himself.